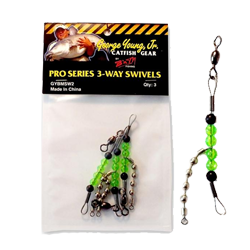 George Young JR, pro series 3-way swivel, the pro series has it all when it comes to 3-way swivels! Unbelievable flexibility and with the chain swivel added, you can bet you'll have no twist and tangles! This swivel is used by pros around the country.